Otago has to be New Zealand's fastest growing wine regions of the current era. It has a remarkable history, not least because of its rich gold mining heritage of the 'rush' years that started with the discovery of gold in 1861 by Gabriel Read. Where there is the lure of gold, there are thirsty miners so it is no wonder than Central Otago's first vineyard was planted shortly thereafter. Jean Desire Feraud, the first Mayor of Clyde, established his winery, which he called Monte Christo, in 1864. The building still stands today and grapes are being re-established nearby. Awards for his wines were won at exhibitions in Sydney and Melbourne, as reported in the House (of Parliament) by the goldfields M.P., Vincent Pyke, in 1881. It was Romeo Bragato, the Italian viticulturist based in Sydney, who is accredited as first recognising the potential of this area when he visited the country in 1895. Starting his tour at Bluff he tasted his first glass of NZ wine at Arrowtown a few days later. He observed many vines growing at Cromwell and Clyde, planted by the miners as they panned out in their search for gold. Bragato decided that Central Otago was "pre-eminently suitable" and there was "no statable limit to the productiveness of that magnificent territory". But perhaps the quote that most excites today's producers is Bragato's "There is no better country on the face of the earth for the production of Burgundy grapes than Central Otago...". The quality of the wines produced today is proving that statement true. Despite Bragato's enthusiasm, the industry died during the early part of the twentieth century. A revival came with grape growing trials during the 1960's and 70's and the 'second wave' of serious viticulture began in earnest in 1981 with planting's at Black Ridge in Alexandra, Gibbston Valley Vineyards in the Gibbston Valley and Rippon Vineyards in Wanaka in full swing. In 2001, over 700 hectares of land was planted in grapevines and 70% of those vines were Pinot Noir. In 2006, the vineyard area has increased to just over 1250 hectares with Pinot Noir now accounting for 77% of production. Visitors marvel at the fact that grapevines grow in this rugged but beautiful landscape of mountains, rivers and lakes in this, the most southerly wine region in the world. But although many of the vineyards are covered in snow in the winter, they enjoy long hot dry summers with cool evening temperatures allowing for a long, slow ripening period. Combine this with young, passionate viticulturists and winemakers and you have the recipe for success. 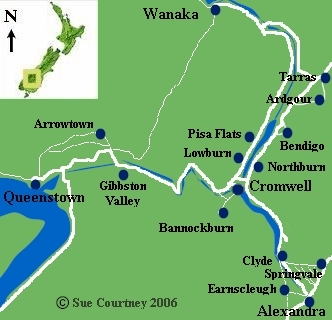 Take the middle point of the region as the town of Cromwell and you find vineyards close by in Bannockburn, as well as in Lowburn and Wanaka to the north, Clyde and Alexandra to the south and towards Queenstown to the west. Drive along any road to these locations as well as northeast to Tarras, and you will see kilometre after kilometre of new vineyards already planted or in the making. Most visitors arrive at Queenstown, the tourist mecca that provides the airport and luxury accommodation for thousands of local and international visitors who come to taste wine, ski, bungy jump or just tour around this scenic wonderland. However Cromwell, with its buildings and facilites left over from the building of the Clyde Dam, provides the central base for the industry. Several wineries and the Central Otago Wine Company (COWCo) and VinPro contracting winemaking facilities are based here. * Figures are rounded and may not add to the total as supplied by New Zealand Winegrowers. About 534 hectares of producing vines contributed to the 2002 harvest but by 2004 the vine producing area had increased to an estimated 820 hectares. As 2004 was a frost-affected vintage, an increase in quantity did not ensue. The major growth variety, as it to be expected with all the planting going on in the region, is Pinot Noir, which accounts for 87 per cent of the increase in plantings. The number of Central Otago wineries continue to expand in such a fashion that if you blink, a new vineyard will have been planted, or a new wine label will have reached the market. As well as resident wineries, larger wine companies from outside of the Otago region, are now sourcing Central Otago grapes for their own well-known brands. Some of the wineries in this list are repeated as they have significant holdings in more than one area. When this is the case, the website link is added only for the location where the winery is based. I list the vineyards within their sub-regions with coloured links to their websites, if known. Chard Farm, Gibbston Valley, Pergrine and Waitiri Creek in the Gibbston sub-region. Quartz Reef, Rockburn and the Central Otago Wine Company (where you can taste the wines from several wineries) in the Cromwell region. Mt Difficulty, Felton Road, Olssens Garden Vineyard, Carrick, Akarua and Bald Hills in the Bannockburn sub-region. Rippon in the Wanaka sub-region. Black Ridge, William Hill and Springvale in the Alexandra sub-region. Also highly recommended is the The Big Picture just out of Cromwell on the road to Queenstown. Central Otago Wine Cellar - The best resource for information about Central Otago Wines. Includes a wine trail map for those wineries open to public. Many Central Otago wines are also available for sale, including some very rare, limited availability wines from tiny producers. Well worth a look. Central Otago Wine Tours - daily tours, customised tours for wine lovers and specialised tours for conference groups. Queenstown Wine Trail - Queenstown's original wine tour visiting boutique wineries and vineyards in New Zealand's southernmost wine region. Daily departures from Queenstown with wine and cheese tastings and superb scenery. If you know of any new wineries in Central Otago, or other links that I should consider for this page, please e-mail me. A reciprocal link would be appreciated. The information on this page was researched by Sue Courtney and normal copyright applies, including the html code.